There’s no time limit for chidren to play but they must have a parent present at all times. When the summer is at its hottest, nothing beats splashing around in a pool. 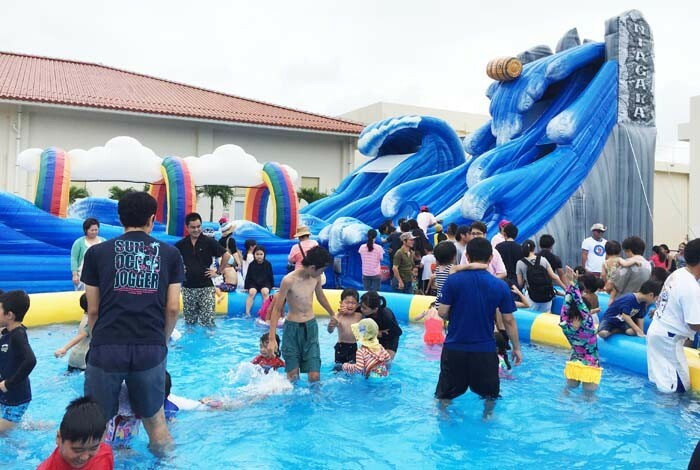 AEON Town shopping center in Yomitan is bringing relief to children this weekend and setting a temporary water park on its parking lot. The shopping center is located in the Furugen area of Yomitan village. And although far from being the largest on the island, there are over 10 shops including Starbucks, Tsutaya, 100-yen shop DAISO and more. There are also several restaurants serving ramen noodles, pizza, and Japanese foods. The aqua park has a 7.5-meter-high water slider and a shallow pool. The park is open this Saturday and Sunday from 10:00 to 18:00. Admission to the pool costs ¥1,500 for children up to high school age. Adults pay ¥500. Children wanting to play in the pool are required to use swimsuits regardless of their age. Water guns and floats are allowed. A parent or adult guardian must be present at all times while the kids are in the pool, and there’s no time limit for using the pool.